Somewhere in these flames was Seb's home. I'm sure you've already read this on any of a number of other blogs already, but, as a kitty reporter, I have to report the news. 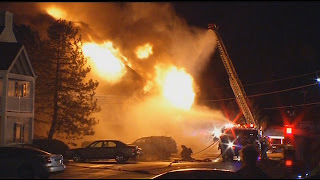 @SeabassCat, his fursib @DottieGP and Mom @BoSoxAmy's apartment building burned to the ground last night. The family has lost everything but all made it out safely. The only reported fatalities in the fire were several furbabies. TW met Amy at last year's Blogpaws Conference and said she's a wonderful and fun person, despite her misguided baseball loyalties. What computed to this kitteh is my furrend Sebastian—you may know his blog Sebastian the Sensitive Soul—lost all his toys, his nip, his food, his beds, his security, and anything else he might've had in there. He had to stay in a hotel last night. Thank Cod, his Mom was home or [shudder]. Not to get overly melodramatic, fire is one of TW's biggest fears because she knows I'll hide UTB at the first sign of activity in the hall. We've had 2 tiny fires in one apartment on our floor and she's afraid if we had to evacuate, they'd have to leave without me. Even if I didn't hide, I'd never let her pick me up even if she tried wrapping a towel or blanket around me. Did I mention that she DID leave me when SHE evacuated once and our apartment got all smelly with smoke. She said she told the firemen that I was up there. They allowed the dog-walker to go back up and rescue all the dogs, but nobody came for me. The Twitter anipal community is very tight-knit and within 15-20 minutes of Seb's first tweet, @GeorgetheDuck's Typist had set up a ChipIn to help them. The money goes directly into their paypal account. If you can't afford to donate today, say a couple of purrayers or send some positive energy their way. I'm purring as hard as I can for my furrend. I hope it helps. You should also leave a word of encouragement on his blog. You can read some other blogs about Seb: George the Duck, Mariodacat, Pandafur, RykerTyker. Please help us help our furrends in their biggest time of need. HUGE hugs from The Pet Book Lady. Happy to give what I can. Thinking of you!!!!! Excellent blog post, Cathy Keisha. Mommy is afraid of that too. She does not have enough hands to get all 5 of us out even if she can manage to drag some of us. How would she pick? We are purring and purraying for Seb and his family and dropped a little in the Chip In too. We know it adds up $1 and $2 at a time. Thanks CK for a pawsome blog entry abt our furiends Seabasscat, DottieGP & BoSoxAmy (Who, btw, does follow the right team! MOL!) I have visited the chip in and will keep all of them in my purrayers. My mom has the same fear of fire as yours-she knows she'd have a hard time finding me if there was a fire and the thought of leaving me in the house freaks her out. Luna & I are so impurrtant to her & Dad-as all of us anipals are to our hoomans. I don´t know Sebastian and his people , but I´m very glad that they maneged to get out in time ! I shall beg mom to hep me put some money in for new toy´s and some food. Fire is super scary. I'm sending all my best purrs to Sebastian and his family. So very sad. We will be chipping later when we are not on the iPad. Great post CK, we're so glad that everyone made it out safely. Our pawprayers are w/ Amy and her family. Mom often thinks about running a "drill" to see how fast she can gather the kitties in an emergency. What a terrifying experience for everyone. Thank God Sebastien and his peeps got out safely. All twelve of us cats are sending lots and lots of prayers their way and also for the fur babies who didn't make it out. When Sebastien gets settled in his new home, tell his peep to send my peep #1 his new address. I'm gonna get her to make him a little catnip toy, okay? A little comfort in his time of need. we were horrified when we read about this last night. It saddened us so. Thank Cod they got out safe...am praying that they had apartment or renter's insurance. We donated last night but we shared this on Twitter and Facebook. So glad they all got out safe, but sad for those pets that didn't. Their humans must be devastated. We posted links today. What a horrible unthinkable terrible thing to happen. I am so glad that so many are rallying to help. I can't imagine going thru this tragedy. Sebastian and I are Twitter friends, sow hen I first heard about this, I was very devastated. I hope they find another safe place to live. Paw hugs and Paw Prayers to their family. This is sure a great post about a very sad event. We are sorry one kitten lost it's life. We have been to visit and left some purrs and hugs etc. Thanks for this info. Glad they got a Chip in going so soon. How frightening and stressful a thing to have happen. It is so wonderful when the twitter world and CB can help out a little. This is so sad!! Our mom worries that something like this might happen to us. We'll get our mom to chip in some green papers to help. Purrs to everybuddy affected by this terrible fire. We will have mommy head over to the Chip In right away and hope that when they all get settled, that someone will have their new address, so that we can send some nip and toys to help make the new place home. Sending snuggles and special purrayers for the little one who lost his life. What a good post my dear, and Rumblemum fears the same thing as your Mummy - I always hide when the carrier comes out, she's terrified she wouldn't be able to get me out if anything happened here. What a shock for all of the people and animals. The Chip In is a very good idea and so good of twitter people and CB people to help out. How devastating! We are heading over right now to donate some green papers. (((HUGS))) and purrs to all. We are purrin hard fur our furriends. Thanks fur sharing the info. Wonderful post, CK. We will be chipping in shortly...have just added the chip in widget at the top of our blog. We're purring and praying for our friends. I put the ChipIn on my blog too. I feel so badly for those pets who lives were lost in the fire, and so glad that Sebastian and Dottie got out safely. My human worries about fires too because it is hard enough to round up three cats when there is NOT an emergency! I put your chip in on my blog & RT it when I see my buddies tweeting it. I think its every moms & dads nightmare. Fire is so scary! We purr for all of those involved, especially the lost furbabies and their families. My woman leaves my carrier out and open, hoping I will become accustomed to it. Great post CK. I think that is one of the downsides of having to live in an apartment. M is hoping they never have to move back into an apartment for that very reason. You can trust your own habits, but what about your neighbors! It would be a nightmare to have to leave a furbaby behind, but if they are hiding where you can't reach them, what can a person do. I'm purring for all involved too. What a nightmare for those involved. Great job reporting. Fire is very scary and Mommy is afraid we would hide. She would be able to find Scylla (she doesn't hide good) provided there was time but Socks and Arty are very hard to find. In fact Arty has a hiding place in the house that Mommy can't find no matter how hard she looks. Maybe your Mommy could throw you in a pillow case if she had to evacuate with you fast. We know you wouldn't like it but at least you would be out of the burning building. How scary! We are purring our furriends got out safely...my mom met Sebastians mom at BlogPaws. We will chip in some green papers. Maybe when they get settled in another place we could send toys and nip too? That is one of the most frightening thing for us cats, or any pet, for that matter. I'm like you, though, I would be prone to hide. We're getting together everything we can, including purrs and prayers that they get back on their feet. Our biggest purrs and prayers go out to Amy and Sebastian, what a tragedy. And our prayers go out to all those who lost their beloved kitties/pets in the fire. We send gentle thoughts of love, light and support to them all. So sad about Sebastian and his family. We will try to rustle up some green papers to help out, if even just a little. we has readed about this tragedy and has been over to teh chipin. so saddies. Hey, you know what? The Human grabbed me up and PUT me on her lap. I may possibly have settled in for a bit and I may possibly have enjoyed a little heavy petting, but I most assuredly did NOT jump up there of my own volition. And I didn't stay for more than 5 minutes either. You don't need to worry that the King is going soft. What sad news! We are purring as hard as we can and are glad Sebastion and his Mom are safe.